We love the Doggie Doo game - dogs, poo and responsible pet ownership in one game! And the fact that the pooping canine is a dachshund is just so appropriate! Players feed the dog plasticine treats, then roll the dice to see how often they squeeze the dog's lead. Every squeeze brings the plasticine closer to the outside world again, and when it appears, you scoop the poop with your little spade. First player to 3 perfect piles wins! Unlike so many Christmas toys this year, there's no batteries to buy, and users report that your plastic pooch might make a 'trump' sound too - an added bonus for most kids! Max the garbage hound, digesting! "Max, a fiesty black and tan Standard Dachshund, ruled our family with a tail of iron. Nothing was safe from his attention, or more accurately, his appetite. Never has a small dog with such short legs eaten, chewed, demolished or destroyed so much. He had the appetite of an elephant; no food was safe. Defrosting chops, cardboard boxes, shoes, socks, washing up cloths, you name it, all disappeared down his greedy gullet only to reappear as a shadow of its former self two days or so later. After three hours worth of the grey concoction, the dog was looking delighted. After five, he was looking full. After six he refused to touch the stuff unless it was laced with meat juices and after eight he gave up entirely and staggered to his bed, belching gently. Next morning he was alive and kicking, if a little constipated… and he never learnt his lesson." 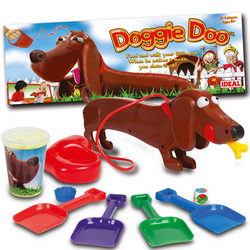 So, we'll be buying the Doggie Doo game for any kids we can find who want a dog - or already has one! Like this Christmas toy for a girl but want something less, er, messy? How about a cuddly Fur Real Cookie Puppy dog instead?